Love the socks. My daughter and her husband are Doc Who fans and I know they would love this scarf. Is it a 1x1 rib? My husband was thinking of getting a Blu-ray DVD but not sure it would make that much of a difference to our already 42" HD tv. One again, love what you knit! Your socks look great! 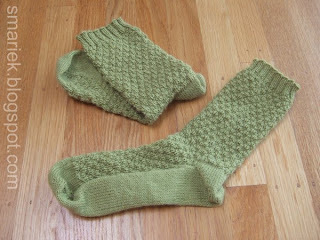 But yes, k2p2 is a great sock pattern, too. I put a mock cable in the k2 every 6 rounds or so; it helps me make both socks the same length. I winced - poor vest, just a poor innocent victim. 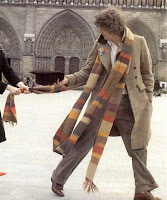 That was a great idea from Michele about putting a cable in the sock, sure beats knitting two socks at the same time! I've seen Taken on Blu ray too, (a friend has one and I love the watch movies there). Glad to see you blogging again!! Love the socks. 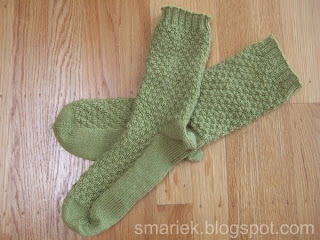 I usually, OK Just, knit simple st st socks with a1x1 rib. my favorite. Do you like the lacy socks as well? Maybe I should break down and knit them. Anyway, Love the socks.